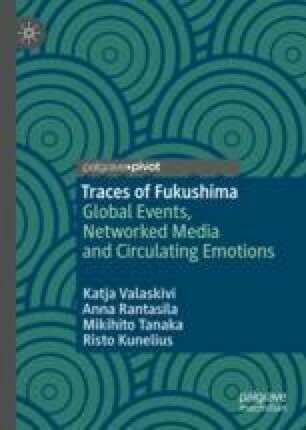 This chapter studies temporal aspects of the Fukushima disaster from the perspective of remembering. This chapter demonstrates how the meanings, interpretations and uses of media events change and develop through time, as narratives and counter-narratives vary and shift. We demonstrate how temporal affordances are dependent on technological affordances and interpretations of a disruptive media event. This chapter contains a social network analysis (SNA) of commemorative tweets from 2016 demonstrating that public actors, such as media operators and NGOs like Greenpeace, gain the most retweets and thus the most visibility. This chapter ends with a qualitative analysis of Greenpeace International tweets 2011–2016 that demonstrate how temporal and technological affordances change the mode of tweeting. Bastian, M., Heymann, S., & Jacomy, M. (2009). Gephi: An open source software for exploring and manipulating networks. Conference paper, The third international conference on weblogs and social media, ICWSM 2009, San Jose. https://doi.org/10.13140/2.1.1341.1520. Cioffi-Revilla, C. (2010). A methodology for complex social simulations. JASSS, 13(1). https://doi.org/10.18564/jasss.1528. Hansen, D. L., Rotman, D., Bonsignore, E., Milić-Frayling, N., Mendes Rodrigues, E., Smith, M., & Shneiderman, B. (2012). Do you know the way to SNA? A process model for analyzing and visualizing social media data. International Conference on Social Informatics, 12. https://doi.org/10.1109/SocialInformatics.2012.26. Hernandez, B. A. (2011). Explore Twitter’s evolution: 2006 to present. Mashable. https://mashable.com/2011/05/05/history-of-twitter/?europe=true. Accessed 20 Sept 2018. Newman, M. E. J. (2006). Finding community structure in networks using the eigenvectors of matrices. Physical Review E – Statistical, Nonlinear, and Soft Matter Physics, 74(3). https://doi.org/10.1103/PhysRevE.74.036104.